"Gripe" means "complaint." Just as in physical stores, online stores may have a book of complaints. 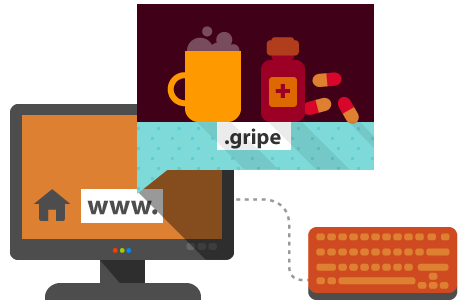 The .gripe domain may be used for such purposes, for example, to set up a forum about product reviews. If you wish to set up your own forum where visitors can share user opinions, then the domain is the right choice for you. Premium domains are different from standard ones in that they have more attractive names (i.e. names for which there is greater demand). Usually, these are names that are short, easy to type and remember, coincide with popular names and expressions, names of famous people, events, places, fashion trends, famous brands, etc. Premium domains may be both new domains, as well as domains that have been registered (active) for a period of time. For domains that are being registered for the first time, the registration price is determined solely by the attractiveness of the domain name. For premium domains that have already been registered and active for a certain period, the price depends, apart from the domain name, on its history, site popularity, "age," economic tendencies, and other factors. The prices of premium domains start from several dollars and can reach up to hundreds and thousands of dollars. For some of the premium domains, the higher price is only paid once, and each year the price for domain renewal is the standard for its area. There are, however, domains for which the renewal price is equal or close to the registration one. For more information about premium domains, please visit our help page. How can I order a hosting plan/domain? How can I transfer my domain and website to SuperHosting.BG? How long does it take for my account to get activated? How do I renew my hosting plan/domain? Do you register .BG domains? How do I register a domain? How do I initiate a domain transfer? What do I have to do in order to park a domain? What is an Add-on Domain? Which PHP versions do you support? Which PHP modules do you support? What is an SSL and can I use an SSL Certificate? Will I be able to create mailboxes after ordering a hosting plan? How much disk space can be allocated for my mailboxes? Payment can be made by Borica system or through 2CheckOut.com. We support VISA, Master Card, Maestro, debit cards, etc. Payment shall be made after the registration in the PayPal system. Payment by bank transfer to our bank account. © 2005-2019 SuperHosting.BG Ltd. All rights reserved Terms of Service. SuperHosting.BG is fully compliant with General Data Protection Regulation (GDPR). If a dispute arises and it could not be solved in cooperation with SuperHosting.BG, you can use ODR platform.